Where do I report problems or ask for help? How to preserve settings across installations? How does the Message Viewer work? How to modify message headers? How do I backup messages with IMAPSize? How do I copy/move messages from one IMAP account/server to another? Can I make IMAPSize work in a different directory than the default one? Can I run IMAPSize from a USB drive? Can I run IMAPSize on Windows 95/NT? Can IMAPSize help me move mail archives from Thunderbird to OE or Outlook? If IMAPSize has displayed an error dialog, please send the error report directly from that dialog. Adding a short description of how the error ocurred can speed up the resolution, so please include it in the email. If you want to report other problems, ask for help, have a suggestion or would like to discuss anything related to IMAPSize, please use the forum. IMAPSize works with IMAP servers only. POP servers, Yahoo/Hotmail and similar services are not supported. Basically, if you can't access your account through a regular email client by using IMAP then you can't access it with IMAPSize either. Most operations in IMAPSize are performed on folders and messages, and these are invoked through the context menus. Select a folder or message(s) and press the right button on your mouse to access the context menu. All IMAPSize settings are stored in the file named imapsize.xml. To preserve the settings across various releases when installing from the zipped distribution file make a backup of imapsize.xml prior to unpacking the new release. Once you unpack the files overwrite the new imapsize.xml with the backed up file. In case you are installing from the installer, your settings will be automatically preserved. Many email services today offer some sort of spam recognition which usually results in a message being tagged in some way. For example, the subject of a recognized spam message may be modified to include the word "SPAM" or a special tag may be added to the message header (e.g. X-Spam-Score: 12). Spam handles are rules that help IMAPSize recognize messages that were marked as spam by the server. They are NOT capable of classifying spam themselves. Messages caught by a spam handle are displayed in a different color in the message list. This can be used for various reasons, one is to determine the optimal spam protection level. IMAPSize ships with one default spam handle named SpamAssassin which will recognize messages marked as spam by the leading product in this area - SpamAssassin. Support for regular expressions is planned and will be available soon. "Smart Inbox" is an account specific setting which defines how your INBOX folder is treated when displaying the mailbox hierarchy and calculating the size of your account. This is a convenient way to get around the fact that many IMAP servers have all of your mailboxes stored under the INBOX personal namespace. The following screenshots will illustrate this. The first screenshot is taken without the 'Smart Inbox' setting enabled, the second one has this setting applied. 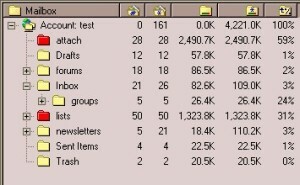 You can see that the first image displays the Inbox folder as occupying 100% of the account even though this is not really the case. This is caused by the fact that this server has the personal namespace 'INBOX' (which means that all the mailboxes are located under 'INBOX'). However, this is not what you expect when inspecting the accounts' size. The 'Smart Inbox' setting enables you to get around this and enables you to see the real size your Inbox folder is occupying (image on the right). 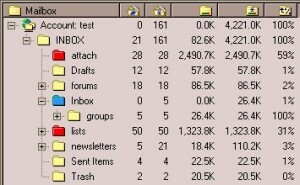 Note that the Inbox folder is blue-colored in the left image. This means that this folder is a virtual one - it doesn't really exist (you can't store messages here), but some mailboxes have it as a parent so it has to be included in the hierarchy. You can change the 'Smart Inbox' setting of your account in Main Menu/View/Options/Accounts. The message viewer works according to the IMAP principle - it shows/downloads only what you want to see. When invoked it only displays the main (text) part of the message, all other parts are downloaded on request only. There are 5 tabs in the viewer: Text, HTML, Attachments, Header and Raw. Their visibility depends on message content. The HTML viewer does not use the IE engine. It will not show any images, either external or embedded. It does not recognize style sheets and will not invoke any scripts. The test I've performed shows that the viewer is safe, but if you have any comments on this issue they will be greatly appreciated. You can save/view attachments in the Attachments tab. Internal viewers exist for some image and text attachment types. Other attachments will be opened with their associated applications. It provides means for deleting attachments from the message and for modifying the message headers. You should be aware that currently there is no message/attachment caching (currently only the message headers are being cached). This will obviously change in the future. Attachments which have been downloaded for viewing are stored in the /attachments subdirectory. For your convenience, these files are kept there even after viewing them, but the program doesn't manage them after that. This is a temporary solution until I come up with an overall caching strategy for the application. To invoke the Message Viewer, select a message from the message list and press 'Enter' or right click and select 'View Message' from the popup menu. To modify a message header, open the message with the Message Viewer, edit the header and invoke the appropriate option from the Message menu, depending on whether you want to save the message on the server or locally. If you have chosen to save the message on the server, the original message will be marked deleted and a new message with the modified header will be added to your mailbox. You can modify the header and delete attachments at the same time (just mark any attachments you want to remove). You can also modify the header with the "Quick and smart attachment deletion" (just modify the header and choose the menu option) - this will strip all the attachments and save the message with the modified header. NOTE: In case the attachments are not being deleted, the whole message body has to be downloaded in order to save the modified message on the server, so header modification without attachment deletion counts double the message size for bandwidth. You should be aware of this when modifying headers of messages with large attachments. WARNING: When you modify message headers you can damage the message so that it becomes unreadable by email clients. This mainly applies to modifications of the 'Content-Type' and other content related header fields. Header modification is therefore disabled by default and should be enabled only if you really know what you are doing. This option can be modified in the Message Viewer section of the Options dialog. In the message list select the messages you want to move to another IMAP account/server. Right click, select the "Copy" submenu, then select "Choose Destination...". In the dialog that appears, select the account you want to move messages to, then select the target folder in that account and press OK. Right click on the IMAPSize shortcut you use and modify the Target field to: "C:\Program Files\IMAPSize\imapsize.exe" /dataDir="C:\New IMAPSize Working Dir"
The next time you invoke IMAPSize, it will use the specified location as the working directory. Yes, just unpack the zipped distribution onto your drive. It will work on any PC since IMAPSize doesn't store any information in the Windows registry (all the settings are stored in a file named imapsize.xml located in the program directory). In order to prolong the life of your drive, it is recommended that you disable caching and logging in the Options dialog. IMAPSize runs out of the box on newer versions of Windows (98/Me/2000/XP). Running it on Windows 95 and NT might require some action from your part. You have to install Winsock2 if you haven't already done so. You can get this file from Microsoft by doing a search for w95ws2setup.exe. You need to restart your computer after changing this setting. Yes, IMAPSize has been used by many people for this purpose. Check this page for detailed instructions.